In Ripoll we breathe sport, history and culture in all its corners, and the medium distance routes are a clear example of this. Circuits that show us areas of alpine meadows, black pine forests and leafy beech trees that don’t let pass the daylight. All of it, with the unbeatable views that we will have from any of its hermitages. Undoubtedly, unforgettable routes. Route to perform at any time of the year, except the days after heavy snowfall. In winter we will have caution with the ice, since the route is mostly shady. We will start the circuit in front of the Pavelló de l’Avellaneda, the Sports Technification Center, and following the route track, we will cross Ripoll ahead of the Monastery (heritage of Unesco) and we will reach the bridge to cross the Freser River, where we turn to the right to make a section of asphalt that will make us pass by the Font del Pla d’Ordina, before crossing the railway, always with caution. Shortly after leaving the train path behind, we will enter the dirt road, first by path and later along the wide path, until we find the trail, to the left with yellow marks, which progressively will go up the Serrat dels Emprius without loss. The trail is very clear and obvious, and we will go back to find a double-strand of cattle. At this point we will pay close attention to the track, between the two yarns separated about 10m between them, we will find the return path, at our left. The entrance of the path is not too defined, but after a first stretch of meadow, next to the spire, and a hard rise, we will find the well-traced path. The path, always with a tendency to descend, will leave us on a track that will continue for about 200m, until we find a sharp curve to the right. At this moment we will see a marked path entry on our left, which once we set ourselves, will be defined to become a very pleasant path through a beech forest. After taking for few meters some stretches of wide dirty road we will arrive to the area of ​​the Jordana fountain, after the Rosa dels Vents point (Rose of the Winds), where it is worth to stop and watch the magnificient views of Ripoll and the Pyrenees. 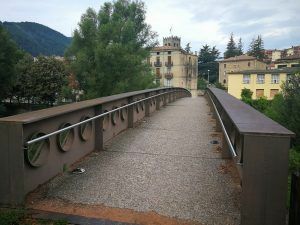 Jordana’s fountain will leave us on an asphalted track that will take us directly to Ripoll, entering the old town of Ripoll and arriving to the Pavelló de l’Avellaneda along the Via Verda (greenway) of the Ruta del Ferro (Iron Route). WATER.- All services at the Pavelló de l’Avellaneda. Fountain of Ordina at the first km. Font d’en Jordana at the last km. Route to perform at any time of the year, except for the days after heavy snow. Circuit mostly by trails without technical sections, very shaded, ideal for spring and summer. We will cross different areas of pasture, where we will always close the wire passages. We begin the tour in the Pavellón de la Avellaneda, with a first flat urban sector that will serve us to warm up. Once we cross the old road of Sant Joan, we turn right to start the rise of the cemetery, and just past it, we will enter a path, in progressive climb, which will take us to pass just below the chapel of Sant Marc, where we will start a gentle descent to the Collada de Comallevosa, and later we will get closer to the Gorg de l’Olla, where especially after rainy days, it will be difficult not to wet our feet. We will continue along an ascending path, always through a forest with some intense short section, up to Collet dels Graus, the highest point of the route. This is an important crossroads, and we will turn right to start a descent to Mas Muiols. We will pass the farmhouse and we will make a sector by forest track, where we will cross the stream and we will be able to refresh. After approximately 500m of track, and after crossing a cattle pass, we will be attentive to our left, where we will find a stone landmark that will indicate the path to follow, now uphill, until linking with a new track, also short, that will allow us to relax the legs before the last downhill sector. We will leave the track once we find, in front of us, a landmark at the entrance of the path. This is a very pleasant road, always with a gentle slope, which we will follow until we make a sharp turn to our left. At this point we should be attentive to the track of the route. The beginning of the path is not very intuitive, but once there, we will not have any problems, arriving at Ripoll along a stretch of forest track, initially dirt and finally cement, which will leave us in a roundabout. Here we will do about 300m by road, always on our left, to cross the River Ter and reach the Ruta del Ferro (Iron Route), where we will make the last stretch before reaching the back of the sports center, the starting point. WATER.- All services in the Pavellón de la Avellaneda. Gorg de l’Olla and Torrent de Muiols where we can refresh. Route recomended from spring to autumn. In winter we will find snow in the highest areas, so we must be informed before going. 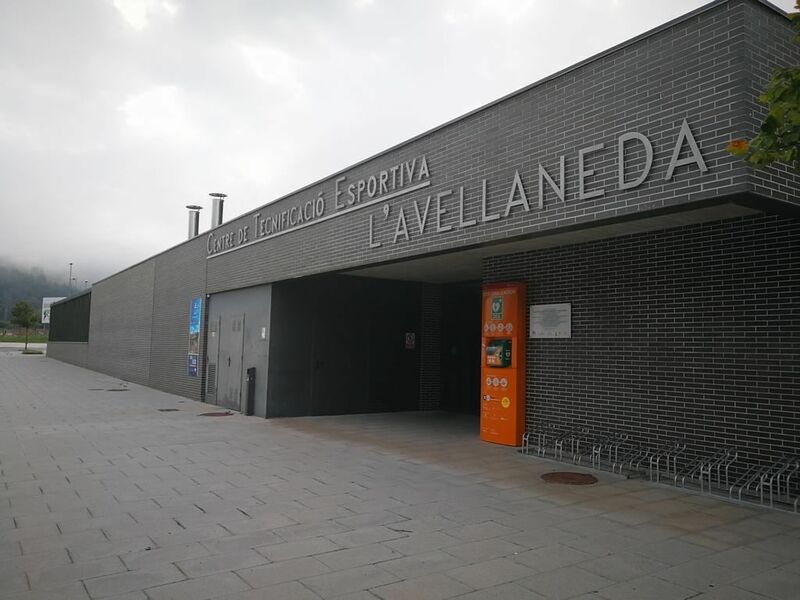 We will start the circuit in front of Pavellón de la Avellaneda, the Center de Tecnificació Esportiva, from where we will cross the road to make the first meters by the Camí Ral towards the CAT (Tourist Attention Center) and cross the Ter River by a bridge and between streets, go up to the cemetery. In front of the entrance we will find the path that without loss will lead us always in ascent until the hermitage of Sant Roc, a great viewpoint of Ripoll. Here we will start a short descent to the Coll de Comallevosa, where we will enter the path again until we find a signpost. Up to this point, the path is shared with the final stretch. In the signpost we will take the road to the left, and always along the path, we will reach the Gorg de l’Olla, and continuing along the path, we will reach the Collet dels Graus, and later to Sant Julià de Saltor, where we will find a farmhouse and a hermitage. We will turn at the farmhouse, respecting the fenced area, and on our right we will find a path, marked in red, that without truce, will lead us to the “Canal de Sant Amand”,a small canal, without any danger, on top of which we will find the Font of Pi fountain. After the fountain, we will find a wooden pass, on a small landing, and turn left along a path that will lead us to the Pla de la Pena, an impressive viewpoint of Baix Ripollès. Here we will make a turn to the right, and uphill, we will reach the highlight of the day, Sant Amand, which with its 1851m is an authentic viewpoint of much of Central Catalonia. We will descend from the cross, and on the right we will begin a long descent, always by path, to Coll de la Tuta, where we will arrive by meadow that we will cross following the track, and where we will see, as a reference, a large rock marked with an X in honor to Xirinacs. We continue straight and we will see a pair of indicator poles that will mark us the path to follow until the hermitage of Vidabona, where we will always arrive by road, they are tendency to descend. Next to the road we will find a small fountain, not always with water, and we will continue down a well defined path, following the yellow signs and the track, which after a short stretch of track, will return us to Coll de Comallevosa, where we will recover the initial section, now up to Sant Roc, and after passing through it again, we will make the last descent that will lead us to the starting point, the Pavello de la Avellaneda. Route that can be done at any time of the year, although in winter we can find snow at the highest level, with which we recomend you inform yourself beforehand. We will pay special attention when crossing the national road near the Font dels Sants. The footbridge over the Merdàs River is a flooded area after rainy seasons. We will start the circuit in front of the Avellaneda Sports Center, and we will cross the road to go to the town and cross the Ter River by a bridge. Following the track we will pass through the back of the Monaterio, and through streets we will arrive at the Font dels Sants, where we will cross the road with caution. This time the bridge will allow us to cross the Freser River, and by asphalt we will arrive at the Font del Tòtil, a leisure area next to the river. Following the track we will cross the train track, and immediately we will take a path to the right, next to a small construction. First we will have a tendency to the right, to climb a wall, and then we will turn left, along a path that is not very marked but evident, between woods, it will take us to the path, which is much more defined, that we will continue to Campdevànol, where we will arrive to a footbridge on the river Merdàs. A little later we will cross again by the bridge of the Barri de la Creu. We go upstairs and first by a wide path, and shortly after by path, we turn left and enter to a path with a steep slope that will lead us to the Serrat d’Estiula, the highest point of the route. At this point we will find a signpost, and we will make a 180º turn to our left, starting a fun and long descent along the path until we come to a track, which we will take to the right, and that will lead us back to the village, crossing it through the streets of the oldest neighborhood to the start point. Route to perform at any time of the year. Ideal circuit to perform series or changes of rhythm. The whole route is asphalted. This route can also be done with children, usually by bicycle, and we will find a leisure area in Sant Joan de les Abadesses. 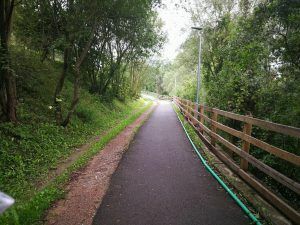 The Ruta del Ferro is a greenway that uses the old mining railroad that linked Ripoll with Ogassa. The flat section, which is the one we will use on this route, goes to Sant Joan de les Abadesses. We will have references of the quilometric points every 500m. Obviously to use the kilometric signs we will have to approach the starting point of the route. 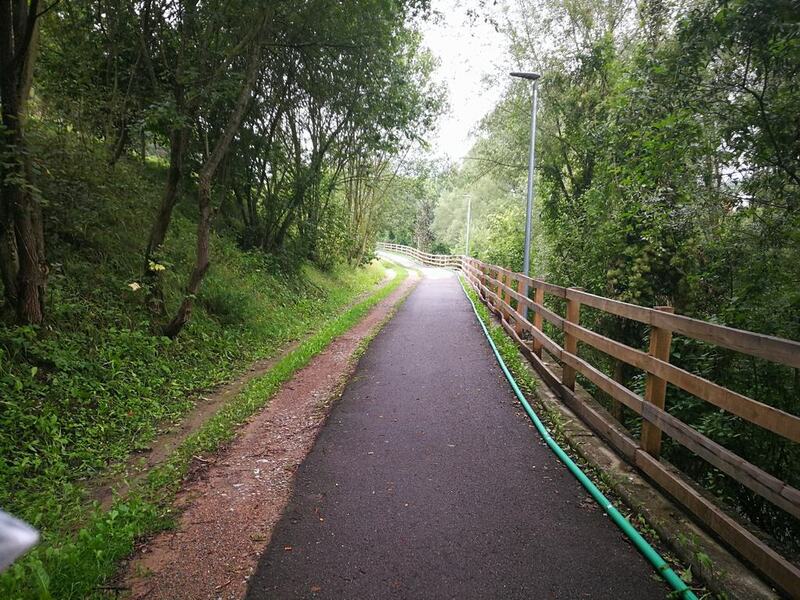 The Greenway (Via Verda) runs parallel to the River Ter at all times, and in it we will find a wooden playground where we can perform strength and balance work. We start the route just in front of the Avellaneda Sports Center, and follow the greenway to the right. The road has no loss, we will not need the GPS, and it is signposted every 500m. The way, direction Sant Joan de les Abadesses, is a very gentle climb, very progressive, crossed a tunnel and two bridges, one on the River Ter and another on a torrent, to reach the Alberg Ruta del Ferro. The return will be done through the same greenway, undoing all the road we have made, until we reach the Avellaneda Sports Center. WATER.- All services in the Pavelló de l’Avellaneda. Source in the first kilometers. Fountain and services at Albergue Ruta del Ferro in Sant Joan de les Abadesses.